Everyone was talking about Atlanta this week -- not the city itself, but two reality shows that call it home. TV fans also tuned in for the return of Jack Bauer, while "Star Wars" lovers wished one other a happy "May the Fourth Be With You." Season 3 of "Love & Hip Hop Atlanta" kicked off Monday night with a bang -- and certainly got fans talking. The series ranked as the No. 1 most social show on television on both broadcast and cable that evening, VH1 said. That's a lot of tweeting and Instagram-ing. Post by Love and Hip Hop: Atlanta. May The Fourth Be With You! That's what fans were telling one other on May 4, aka Star Wars Day. "Episode VII" director J.J. Abrams marked the "holiday" by posting a video from London, where production on the new film is taking place, telling movie-lovers that more casting news is to come. The war of words (or lyrics) started when Lil Durk released "Chiraq" last Saturday, a song that featured a jab at Tyga (reportedly because the latter stopped responding to texts for planned collaboration, per MTV). Tyga then responded with a track of his own, "Chiraq to LA," with a verse directed at Durk. Other rappers like Game and Chief Keef have gotten involved in the beef as well. As Andy Cohen said: "End Scene!" After three parts, the brawl that resulted in Porsha Williams' arrest and many, many props, "The Real Housewives of Atlanta" reunion came to an end with a two-hour finish on May 4. Did you tune in? Post by Real Housewives of Atlanta. 5. Jack Bauer is back in "24: Live Another Day"
Jack Bauer returns! "24" came back to Fox this week with the debut of "24: Live Another Day." The action-packed premiere, which brought Jack to London with the CIA on his trail, certainly got a lot of people talking. While reviews may have been mixed, "The Amazing Spider-Man 2" lived up to its "Amazing" name at the box office. The film, starring Andrew Garfield, Emma Stone and Jamie Foxx, raked in $92 million dollars in its debut at North American theaters last weekend (it opened earlier -- and brought in even more money -- in international markets). Have you seen it? The WWE has released a video paying tribute to Connor "The Crusher" Michalek, a young fan who recently lost his battle with pediatric brain cancer. Michalek got to meet his favorite wrestler, Daniel Bryan, in 2012 and the WWE invited him and his family to this year's Wrestlemania, where he got to step into the ring with wrestling star Triple H. Grab some tissues before you watch this one. 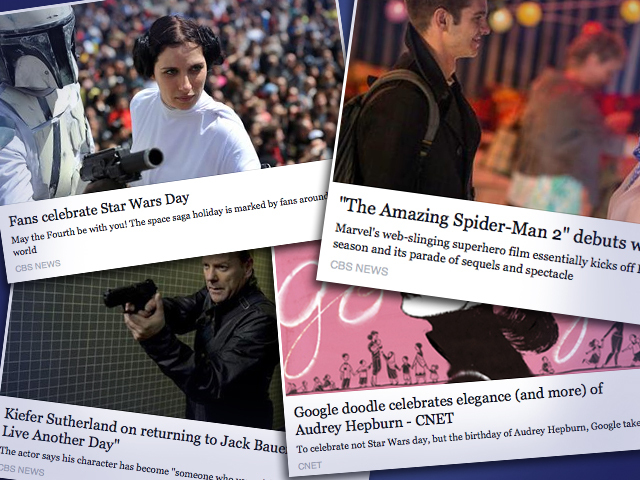 May 4 wasn't just Star Wars Day -- it was also what would have been Audrey Hepburn's 85th birthday. Google paid tribute to the Hollywood icon, who died of cancer at the age of 63, with a doodle on its homepage. Others remembered her by watching her films -- "Breakfast at Tiffany's," "Roman Holiday," "My Fair Lady" and more -- and looking back at her still-envied elegant style. We'll just leave this here. Do you like his new look? Or does he look better with darker hair? *Buzz rankings reflect the top entertainment topics being discussed on Facebook, May 4-7, in the United States. Rankings are based on both frequency and momentum: the Facebook conversations that not only got a lot of buzz during the week, but also saw a notable increase compared with the previous week.